Digitālās klavieres ir instruments, kas imitē akustisko klavieru piesitienu un skaņu. Tām ir pilna apjoma klaviatūra (7 pilnas un viena trešdaļa oktāvas jeb 88 baltie taustiņi), tās ir viegli pārvietojamas un nekad nav jāuzskaņo. SP4000 is a lightweight and space saving solution for stage performance, studio and home at an affor.. Although SP4200 is compact in size, it is equipped with powerful features. 600 voices are avai..
DP-260 digital piano has been conceived to offer sound and touch of an acoustic piano. 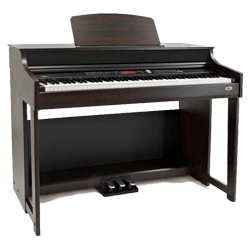 Featuring an..
88 Keys with Scaled Hammer Mechanism II (Tri-Sensor) with ivory touch keyboard in ebony and ivory..
GHS Keyboard with 88 keys Pure CF sound engine Intelligent acoustic control and acoustic op.. Authentic Key TouchThe KDP90’s Advanced Hammer Action IV-F (AHA IV-F) keyboard action has..
Grand Touch keyboard 88 Keys weighted with hammer action mechanism Key cover Sound gene..